Who doesn't love catching a big beautiful trout. Their large and small spots make for unique artwork on the canvas of life. 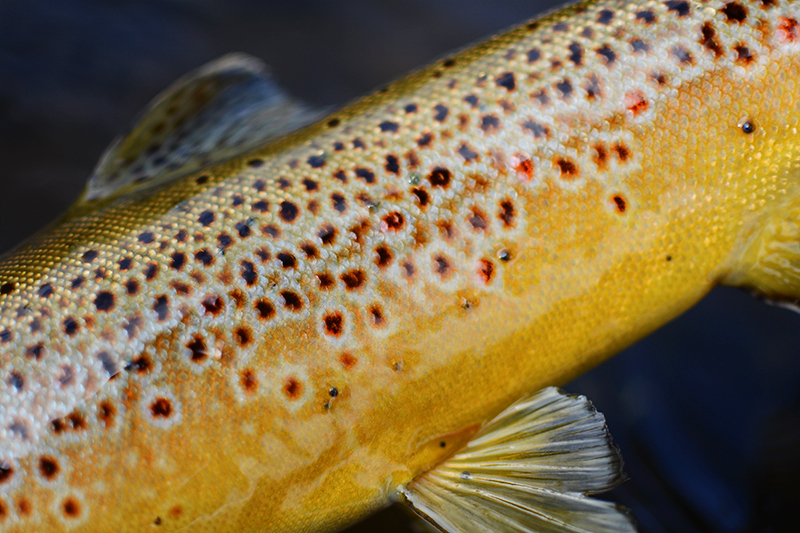 Unfortunately, these are not the only spots that can decorate a trout's side. During one of my busier semesters this past year I had been spending my scant fishing time on the Henry's Fork of the Snake River, and what I encountered had me somewhat concerned. Diversion dams litter the landscape here in Idaho. It's how we water all those potatoes. It's not altogether a bad thing. 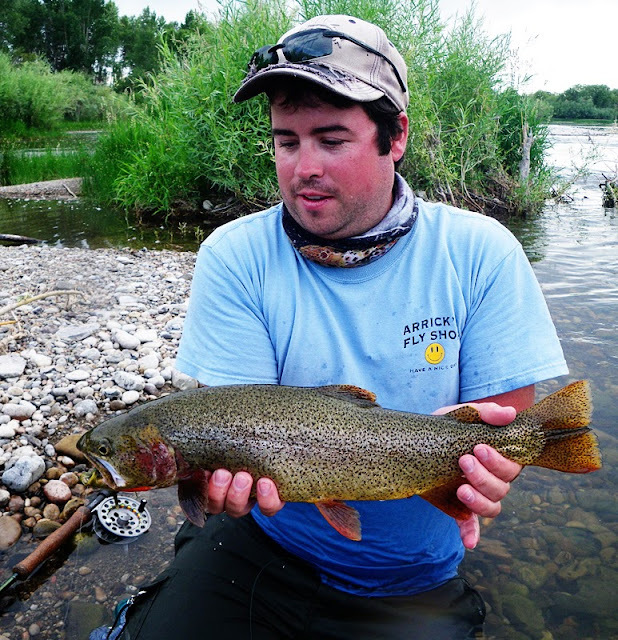 It often presents excellent fishing opportunities, but the fact is, they are not natural, and often prevent nature from taking care of business. The situation it creates is similar to the plaque that builds up in a human artery. Poor circulation ruins health and prevents cleansing. The main culprit fueling my concern is a parasite called Neascus trematode. And, while fishermen often like worms, these little guys are a pain in the side, or neck, or whatever other fleshy surface they can sink themselves into. The process can ugly up a trout in a hurry. Neascus trematode is a type of flatworm, called a fluke. These parasites burrow into the flesh of a vertebrate (trout in this case), after which the host encapsulates the parasite in melanin, creating a little black cyst. The fluke lays dormant inside of the cyst, waiting for its host to be consumed by some type of fish-eating bird. Once the fish has been consumed by a bird, the parasite matures and lays eggs inside the bird's digestive tract. The eggs are then scattered in the birds droppings. Once in the water, the eggs hatch, and the babies look for a host to mature within. In this stage they only have a short while (roughly 24 hours) to find their next victim, which, in this ecosystem is a snail. Once in the snail, the parasite matures. Then they leave the snail, looking for a fish to burrow into, and the cycle begins all over again. Now, I'm no official biologist (though I do aspire to teach biology), but the proliferation of the parasites seems to be dependent upon how many hosts are available, for any of the given stages. In many river systems snails are a normal part of the ecosystem, but the quantity is kept in check by a lack in standing, silty water. Here is where the dams become a problem, especially on beautiful freestone rivers like the Henry's Fork. When the parasite is present, and silt and still water allow for snails to reproduce in copious amounts, the result is a spurt in parasite population. This is exactly what I have observed on the lower Henry's Fork in places that have not previously been affected by the parasite. 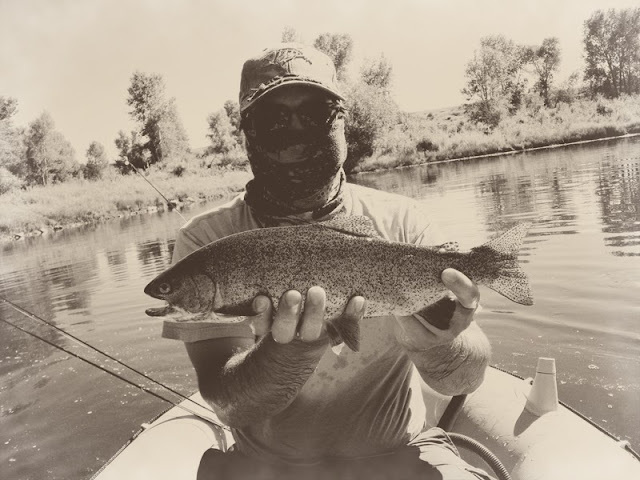 To see it down lower, where the water meanders through silty farm fields is to be expected, since the Teton river is rampant with the parasite, but up further, on some of the water that is classified as world-class fishing, it is a frustrating find. In 2008 the Fall River Electric Cooperative was given the green light to install a rubber bladder system on top of the already constructed Chester Diversion Dam. The bladders added height to the dam, to further divert water into their little power-plant by increasing the water depth. This created even more of a lake than there already had been. Now, I'm not sure that the bladders made things worse or not, or if the increase in parasite population has been a direct result of warmer temperatures, but I had not noticed any fish infections before their installation. I feel they have slowed the flows enough to cause greater silt collection (more breeding ground for snails), and warmer water. The combo is hard on the fish. Warm water, and parasites! This past summer the vegetation in the water was incredible, which is definitely a correlation to warmer water. Now, I'm not sure how big of a role the dam changes play in this little equation, but it seems to be the straw that broke the camels back. It has the potential to be a tragedy for those who love the big feisty beautiful trout of the lower Henry's Fork. I wouldn't be too concerned if I had only noticed it on one or two fish, but I noticed it on every brown brought to hand, and I have seen just how bad it can become. Also, by way of note, this is not likely to become a concern much higher in the system, as the water maintains a decent flow. It is just frustrating to see it taking such a hold in the lower stretches. For those concerned about human health: The black spots (cysts) that result from the infestation have not been found to be fatally harmful to the fish, or even to anyone consuming the fish, though it is recommended that those who choose to eat the fish will do so after thoroughly cooking the meat. I wish I had some kind of solution for this problem, but when money is involved, I worry that much can be done. Is it a large enough cause to rally behind? Is it even a real issue, or maybe a spike in the natural ecology? Is fish and game aware? Do they even care, or do they have bigger fish to fry? (Pun extremely intended). At this point, I feel the best thing we can do is to keep an eye on it. With this winters snow pack, it bodes well for the coming year bringing a good flush. Who knows, if we have multiple winters like this one, maybe it will succeed in cleaning the system up as well as providing plenty of cool water for the fish throughout the warmer months. Let's keep our fingers crossed.